Last year, I wrote a popular post about improving your day-to-day experience on Android devices by using launchers, icon packs, battery managers, and other utilities. With so much fragmentation (on both hardware and software), Android can be a tough beast to tame, but using a classic combo such as Nova Launcher + Stark is a good way to essentially get a blank slate so that you can tweak appearance and functionality to your own desire. Still, it’s a bit of work. Not all users are going to feel comfortable (or be able to) leave behind the stock Android or Google Now launcher for something else. Plus, icon packs can quickly become annoying – they vary widely in the number and type of icons they support, or you might find one that has a great G+ icon but for some crazy reason doesn’t have an icon for Evernote, for example. Leading icon pack makers, most notably Kovdev, have feature request backlogs that could literally take years to implement, and as such have implemented a premium system under which users can pay a fee to have a particular icon(s) added soon. The great Out There space simulator is one app that I noticed getting the fast-track treatment in Kovdev’s packs. But who is going to pay $5-$10 for an icon? LINE is nominally a communications app that includes VoIP calling, OTT messaging, and videoconferencing. Many probably know it as an app that is full of a dizzying array of stickers, revenues from which fuel LINE’s ad-free business model. It’s much more sophisticated that WhatsApp, Viber, or Tango, all three of which have been the subject of blockbuster acquisitions and/or financing this year. It’s heady days for messaging apps. LINE, though, is an entire platform: just look at its range of services. The LINE Camera app is feature-packed photo editor that taps into the same premium upgrade system as its main messaging. 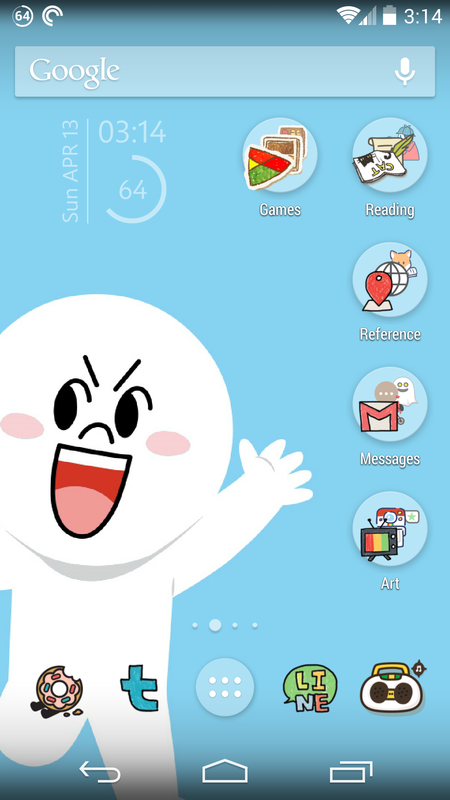 LINE Deco is a custom Android experience in one package – wallpapers and icons included. All of these icons are running on the default Google Now launcher on a Nexus 5. LINE Deco has pulled off the feat of making Android customization simultaneously more advanced and much easier to use (not easy to do) – no extra launchers or standalone icon pack-apps are required, yet users can choose from a huge variety of differently shaped and colored artwork (I went mostly with a hand drawn theme). Before Facebook began its quest to separate services into multiple apps (Paper, Messenger, Poke) and in the midst of Google’s efforts to do something similar (making core Android functionalities such as the keyboard and Google+ backup photos into their own apps), LINE figured out that an overarching social experience can be distributed across a bunch of interconnected silos. Chatting, calling, customizing your home screen, taking photos – it’s all part of one experience that can be targeted with related apps. That’s why I said that LINE was a platform. If WhatsApp can be found for $19 billion, it’s hard to fathom what price LINE could command were it actually for sale. It’s letting us make our devices more personalized, while keeping us within its increasingly rich ecosystem. I’m all for this mobile future supported by icon pack and sticker sales rather than tons of ads.